And yet, it was only a matter of time (and not much of it) before the conversation shifted to… you guessed it: cats. Not that this is anything new, of course. Just a month earlier, Doug Smith, “outdoors” columnist for the Minneapolis Star Tribune, had taken a similar tack in response to bird deaths caused by the recently completed U.S. Bank Stadium, writing: “it’s cats—yes, common felines—that pose a much bigger threat.” And wind energy advocates eager to divert attention from the impacts of wind turbines have been playing the “outdoor cat card” for years now. As long as junk science is legitimized and facts are up for grabs, the greatest threat to birds isn’t cats, glassy buildings, or wind farms—but the organizations and individuals who continue (knowingly or not) to mislead the media and the public about the issue. Møller, A.P. and J. Erritzøe, Predation against birds with low immunocompetence. Oecologia, 2000. 122(4): p. 500–504. Baker, P.J., et al., Cats about town: Is predation by free-ranging pet cats Felis catus likely to affect urban bird populations? Ibis, 2008. 150: p. 86–99. You say cats only prey on the young and the old and the weak. I’ve seen cats take perfectly healthy birds. But I have no proof…do you? Or do you simply believe in things because you’ve heard them repeated over and over. Is there any way you could recommend people try to get cats off the street? If cats are safer? Don’t you want kitties to be well cared for? I know you let your cats run free. I truly hope we can find someway to find a way to work towards what is best for the cats…. and birds. Not what’s best for the giant uber wealthy cat lobbies. Take care of those kitties of yours. I don’t think it makes ANY sense to try to distract from the facts re cat predation on birds by noting how birds are killed in collisions with buildings or wind turbines. Those are real deaths and they are wrong. But, feral and free roaming cats kill many birds that leave the nest before they can fly, which is typical of most native passerine birds in the US. There is simply NO excuse to have cats running around in nature…they are an invasive species in the USA. IF the cat people CARED about the cats, they would establish TNS as the system to care for them. With Trap/Neuter/Secure the cats are safe and so are the wild birds and animals. TNS is being used by individuals and by some organizations in the US. Responsible cat lovers should employ this system IF they are serious. There is no valid excuse for free roaming and feral cats destroying native wildlife. None. This article does not offer any solutions, new ideas, nor facts and does not show any research against articles mentioned herewithin. The writer is good at dissecting research, yet does nothing to conclude or give insight on the topic. The whole basis for this cat loving logic is based on a flawed comment: “Like all predators, cats tend to prey on the young, the old, the weak, or unhealthy”. Which undermines the argument by mentioning “the young” – as the young are the lifeline to all future generations, so therefore to target the young is to bring about the demise of the species that is being attacked. Julian, regarding “solutions,” I’ve been promoting trap-neuter-return for the seven-plus years I’ve been publishing this blog. During that time, I’ve also provided a great deal of evidence that, contrary to your claim here, predation by cats has no population-level declines other than in very limited contexts (e.g., some small oceanic islands). Laurella, if you object to all “real deaths,” I assume you’re morally opposed to the predator-prey dynamic itself? I can’t imagine that’s what you’re suggesting. If by “trap-neuter-secure,” you’re referring to sanctuaries, I’d like to point out that this is a very expensive “solution” available only to a handful of cats. What about all the others? Liz, the studies I refer to in this post go into considerable detail regarding the health of the birds examined. It’s almost certainly the case than many appeared to be perfectly healthy but were not. The best way to “get cats off the street” is to sterilize as many of them as possible, and find homes for those who would make good adoption candidates (as resources allow). People who believe that invented notion that billions of birds are killed by cats, ignore the ENORMOUS impact of humans. Just ONE example: all the poisons use by agriculture that kill not only birds, but the very food birds rely on, as well as beneficial insects, amphibians, other animals, etc. The book Silent Spring was NOT written about cats. This was in the early 60s. The problem is far FAR worse today. 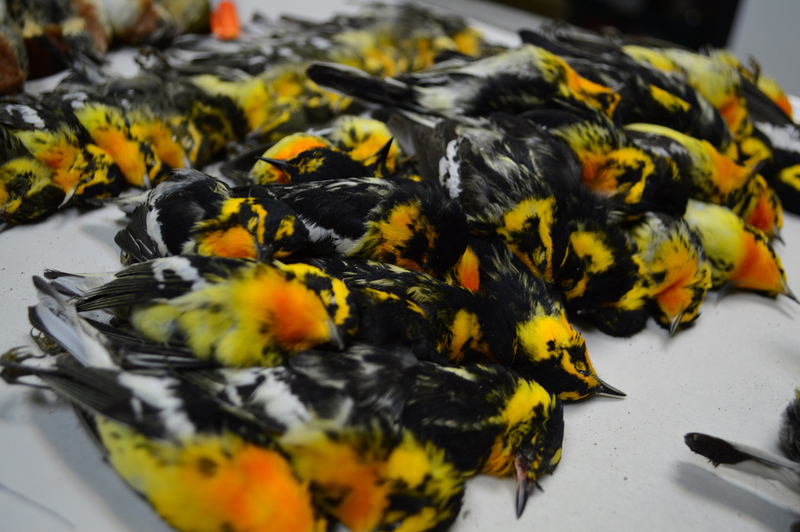 The number of birds killed by cats is minuscule – cannot compare! – to the decimation wrought by humans. What humans have been and are doing to cause maiming and killing of all life on the planet, and invasion and destruction of habitat, of all types of insects, amphibians, reptiles, birds, mammals and fish, will, hands-down, win the prize for outnumbering, in the trillions, anything the domestic cat could EVER do. Until THIS is addressed, I refuse to participate in accusing cats of being high killers of birds. I will defend the domestic cat. Especially since most domestic cats are, in fact, kept INDOORS. Humans, in our excessive numbers, are leagues ahead as the worst, most invasive and destructive species on earth. Put bird-deterrents on your windows to keep them from flying into the glass. Stop using pesticides and herbicides on your lawn and in your yard. Stop using dryer sheets – that stuff is toxic, and goes straight to the outdoors air. Fight against the use of poisons in agriculture. Fight against excessive logging, all over the world. finally, realize that we humans ARE over-populated — if you think we are not, you have failed to see the Big Picture; it is far larger and more complex that you have given full, proper consideration. I refuse to join in this blaming of cats for as long as the FULL human impact is ignored. YES to trap-neuter-release. YES to educating people as much as possible about getting their cats (And dogs) sterilized. AND A VERY BIG YES to stopping human over-population. Until then, I will continue to allow my cats (all sterilized) to enjoy the great outdoors. They are animals. They need to be able to go outside, for as long as we live in a safe enough environment for them to do so. Except that TNR has not been shown to work to reduce feral cat populations in any area larger than a college campus anywhere in the United States. No town, city, or county anywhere in the country can state that its feral cat population is smaller now than is was when it started TNR. Not one. I’ve seen that studies of birds in the wild *that were conducted before PETA was founded* noted that the most common predator of birds was… other birds. Eagles, hawks, owls, even ravens, prey on other birds far more than on mammals or fish. The next most common predator of birds was… snakes. It seems that many species of birds have an odd blind spot concerning snakes, and simply can’t recognize them until too late. And the third most common predator of birds (something that I’ve rarely seen mentioned in the past 20 years) is… rats. Rats are carnivorous omnivores, very good at burrowing, at least as good as cats (being lighter) at climbing, and particularly prey upon *eggs*. Recent archeological studies have shown that rats, not sailors, exterminated the Dodo. That’s win, place, and show, with cats not even in the money. If you’ll look at the biologists’ list of the 100 worst invasive species, you’ll find that the two animals at the top of the list are the common or house *mouse*, and — by a whisker — *Rattus rattus*, the common ship, wharf, or sewer rat. Those 33 (or is it 35? Reports are so imprecise) species that were supposedly exterminated by cats could just as easily have been exterminated by rats — which arrived first, thank you. Why do you think those early sailors brought cats on their ships in the first place? How do you think the “ship” rat earned its name? There is no really comprehensive study on cat predation patterns, but those few studies that hung small video-cameras on suburban domestic cats and recorded their outdoor prowlings showed the cats eating primarily from neighboring cats’ food bowls, and secondarily from occasional kills of small rodents — mice, rats, moles and gophers. Since there are no comprehensive/honest studies of cat predation, we have to draw conclusions form anecdotal reports and “reverse engineering”; domestic cats are superbly evolved to hunt small mammals — in other words, rodents. Note that cats have infra-red vision, allowing them to see heat, which assists them in hunting in the dark. Rodents come out of their dens to forage at night; the vast majority of bird species are nested and inactive by night. It’s remotely possible or a cat to successfully hunt birds, or fish, under unusual circumstances, but clearly they’re not designed for it. If it turns out, as the evidence is beginning to show, that those extinctions were performed by rodents — particularly rats — then the house-cat has, in fact, been protecting birds by holding the populations of rodents at bay. JJ: Why do you think sterilization efforts can’t be scales up—from, say, the college campus to surrounding neighborhoods, etc.? How do you explain the “kitten-free zones” observed in parts of New England? Or, let me turn the question around: which town, city, or county has demonstrated any reduction in cat numbers via lethal means? Wolf says, “…the discrdited 2013 paper, ‘The impact of free-ranging domestic cats….'”. The reference is Loss S.R. et.al. The impact of free-ranging domestic cats on wildlife of the United States. Nat. Commun. 4:1396 doi: 10.1038/ncomms2380 (2010). The “discrediting” was by Gregory J. Matthews, who could have sent his remarks to Nature Comunications or some other reliable publication as a response to Loss et al. He did not. He sent them to the advocacy group Alley Cat Allies on March 4, 2013. I wonder how many statisticians ACA solicited before they found a statistician who would write a critique they liked. Matthews’ objections to Loss et al are based not on standard statistical practice but on personal preference. He objects to Loss et al using Monte Carlo methods instead of meta-analysis. Bizzarely, he confuses using results from published research with extrapolation. He objects to Loss et al’s use of the uniform distribution, but does not say what distribution he prefers or why, or how to calculate its parameters. He thinks that finding the smallest and largest numbers in a set of numbers is not a statistical operation. He complains that Loss et al did not weight the studies they analyzed, but in fact they did. Loss et al read many papers about cat predation and related topics; they assigned some papers w=0 and other papers w=1. They described their weighting (selection) method under “Method”: “Literature search” and “Study inclusion criteria.” Matthews failed to describe a weighting method he prefers. Loss et al emphasize that their wildlife mortality estimates are a first approximation, limited by a shortage of data. They say, “Increased rigor of mortality estimates should be a high priority and will allow increased comparability of mortality sources.” Four years later, cat advocates have failed to publish more rigorous estimates. We especially need a better estimate of the number of unowned and free-ranging cats. Yet very little data have been reported on this crucial parameter. If Matthews dislikes the statistical methods of Loss et al, he could write his own analysis of the same published papers listed in Loss et al. Perhaps Alley Cat Allies and Vox Felina wll provide funds for him to do so. Yvretta Carus: Please consider reading additional posts here before you post comments—I’ve provided a great deal of information that’s relevant to the topic. Peter Marra must be stopped.